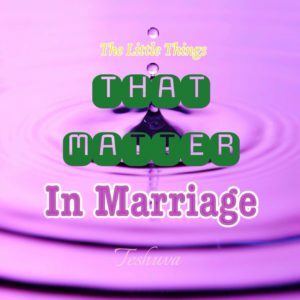 Home » Little Things That Matter In Marriage. 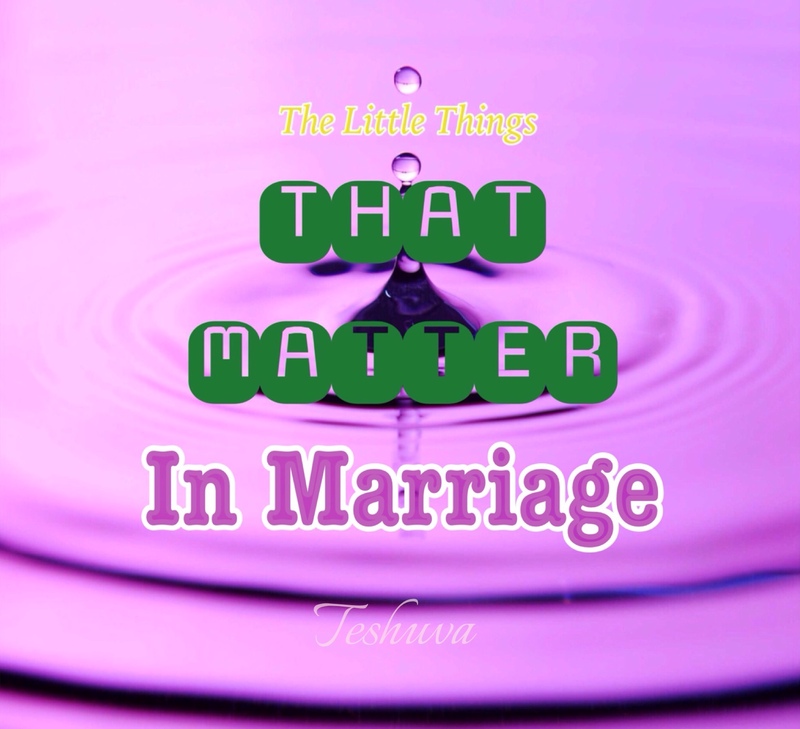 Little Things That Matter In Marriage. Many times we expect our spouses to do the “big things” for and with us or sometimes we want to do “big things” for our spouses or to enhance our marriages. And we often neglect those things we might consider “little” while thinking so hard on the “biggies”. But it is the really “little” things we do for our spouses and in our marriages that make the seemingly “big things” make meaning: Luxury gifts, expensive vacations, surprise getaways to mind blowing destinations…the “big” things… I love all these I must say and I will not mind having them at all, but only when the “little” things are in place. Put in another way, if these “little” things are not in place, the “big” things will not count for much in the hearts of our spouse. The Little Things Grow To Make Huge Impact. Below, I will share some “little” things that make great impacts on marriages, with or without some those “big” things. It could be taking a walk together, or a drive around town, just enjoying time together and enjoying the day as you talk with each other about anything and everything. Talk about how much you appreciate each other and discuss ways you can make your relationship better and how your marriage can be more pleasing to God, and impactful in His kingdom. Talk about your children, their developments, the joys they bring you, the difficulties you face with them and how you can parent them better… just talk. It is also important to spend time with each other doing what your spouse wants to spend the time doing. Communication is not complete if the other person does not understand the message in its entirety. Couples must ensure that they communicate with each other, by words, body language and ended with an assertion of understanding. Constant misunderstanding will cause a rift in any marriage. I hate to admit that sometimes I am too serious about something or too shy to play, meanwhile my husband could play with me for as long as possible. But I know that the times I do (yes I DO) we are both excited and it is quite refreshing. So take the time to play. I love it when we play scrabble and dance (l LOVE to dance). Lots of touches, hugs and kisses. I love hugs and kisses, lots of them… but still trying hard to deal with shyness in public. Gentle touches, rubs, pats and the like are very healthy for couples. Touches say a lot of things that words may fail to convey at the time. So please, have lots of touching, hugging and kissing go on in your marriage. Grudges will suffocate love… don’t do it. Don’t sleep with an unresolved issue in your heart. Don’t take life’s issues too seriously. Never get tired of helping your spouse. Picking up bags, opening car doors, helping out with chores, bringing up a glass of water, running errands… There is always a harvest for every seed and love is never weary or wary when it comes with helping. Always appreciate your spouse for who they are not who you want them to be, for what they do, no matter how “little” or “trivial” the things they do might be. What you appreciate appreciates. Consider your spouse’s good at all times. Not saying you should not care about you, but make sure it is not always ALL about you. Your every action or inaction will have a consequence on your spouse. Think about that! Never believe or make decisions based on your assumptions. Never do anything in your marriage outside God’s word. You cannot go wrong in your marriage following the principles spelt out in The Bible. Walking outside God’s word means walking in darkness, and stumbling or falling is the result. See your spouse through God’s eyes. If we spend time in God’s word and allow it rule our hearts and lives, we will begin to see our spouses like God sees them and that will change a lot of things. Work hard on growing your love for God. It produces corresponding growth in your love for your spouse. You cannot love your spouse any more than your love for God. I know more “little” things can be added to this list but these are some of the ones I consider basic. Do you believe in the big things only, little things only or both? 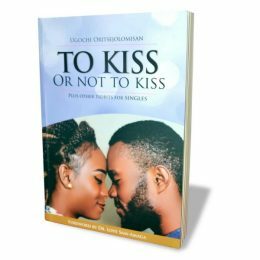 If we would connect consistently in these small ways, Ugochi, I’m convinced it could take a marriage that’s on the brink of divorce to one that’s growing and encouraging to both spouses. The trick is being committed to it and not letting the daily grind “grind” our relationship away with busyness and stress. I love how you and are I are on the same page this week, dear friend! Blessings to you and your hubby! Amen! Thanks very much Beth! Yes, little drops of water make a mighty ocean. Love this article. It is neglecting the little things that often to lead to other things becoming big unnecessarily. Thanks for sharing. I completely agree! Thanks very much for coming by ma, do have a super blessed day! Sure a nice piece there.I pray for more grace in Jesus name.thanks for adding flavour in marriages.God bless you. God be praised! Thanks so much for coming by, do have a super blessed day! it is really “little” things we do for our spouses and in our marriages that make the seemingly “big things” make meaning. This is so true, taking time out to just listen can make a huge difference and save unnecessary arguments and ill feeling. I would say love regardless of the situation, no storm is permanent. Love conquers all. Love does conquer all, always a winner! I can never get bored of reading ur articles Mum.. U r blessed with words of Grace and these words are honey without the bee sting to my soul n am sure others also.. Am not married so i can’t Tell much but from observations esp in my parents marriage, i have learnt one Key thing UNDERSTANDING.. If i dont understand my spouse, d big things wldnt matter.. By this i observed somefin which i shared with my Mum dis morning.. I noticed my dad likes our family devotion to be as quiet as a graveyard, no movements, noise etc save d scriptures or praise n worship n Mum likes it wen all her kids are present n during this she tells one of US to go n CaLl d other(Who is still probably sleeping) or she goes herself n obviously Mr Phillips gets irritated n wen she tries to cajole HIm later, he snubs her 4. Few minutes etc… Dere r individual differences BTW siblings, couples etc but d ability to manage such with a Deep understanding helps n makes d trips, outings etc memorable n pleasant.. I liked the part Where u wrote That u talk about d joys each child brings etc.. It made me feël special n wonder about what my parents say to themselves about me.. Lol.. God bless u Mum. Lol Deola! I believe they say good things about you, you have no doubt made them proud in ways you do not know. Keep upholding your Dad, it won’t be long and he will be the one doing the morning calls for devotion and perhaps with a big tambourine in hand. It was so nice seeing you after such a long time yesterday,love you loads, have a super blessed day!